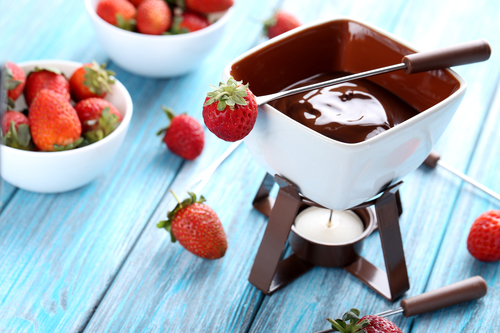 At Vorrei we are big fans of super hot Italian chilli pepper and we love this Valentine’s recipe for a spicy chocolate fondue with a kick! You don’t necessarily need a fondue set to be able to make this recipe – just use a ceramic dish to keep the chocolate fondue warm for as long as it lasts! Chop or break up the chocolate and place in a dish. Melt over a pan of hot water (bain marie) and then slowly add the cream and mix in well – don’t boil. Add a pinch of chilli pepper to taste. Transfer the chocolate mixture to a fondue set if you have one or a ceramic dish. Enjoy with the fruit of your choice! We recommend pineapple, papaya, mango or strawberries of course! Buon San Valentino! Happy Valentines Day!